Our solid hex dumbbells are designed with the user in mind. We use ASTM-grade 20, the highest quality gray iron casting available. Our hex dumbbells are coated with a durable resin based paint and baked for one hour to assure a finish that is chip, abrasion and corrosion resistant. Since 1987, Troy Barbell has been developing and manufacturing free weights and fitness equipment while providing unparalleled quality, service, and satisfaction to its growing customer base. Today, the Houston-based company is one of the top free-weight manufacturers in the industry with a diverse range of products and a full commitment to use only the highest grade materials and designs. The Troy family consists of three lines: USA, leading-quality home fitness; VTX, committed to specialty and training applications; and Troy, the premium line of free-weight equipment for commercial and institutional. This set inlcudes a pair each of 5 - 100lb dumbbells in 5lb increments. Disclaimer: Using Troy Prostyle Dumbbells on this rack is not recommended and will void the warranty. 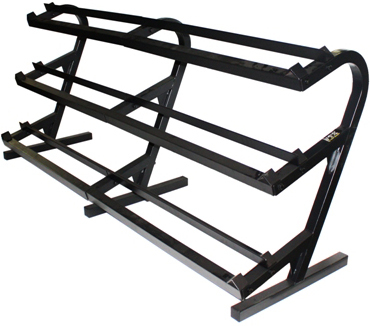 Product/Shipping Weight: 195 lbs.94” L x 26” W x 41” H.
Product Description: The VTX Deluxe 3-Tier Horizontal Dumbbell Rack will hold up to 23 pairs of USA and VTX dumbbells ranging from 3 lbs. to 100lbs (including 8 & 12 lb. sizes), and will hold up to 20 pairs of Troy dumbbells ranging from 5lbs to 100lbs. This durable rack is constructed with 12-gauge heavy duty 2” x 2” tubing and designed to efficiently store a wide range of dumbbell sizes for institutional, vertical and home applications. 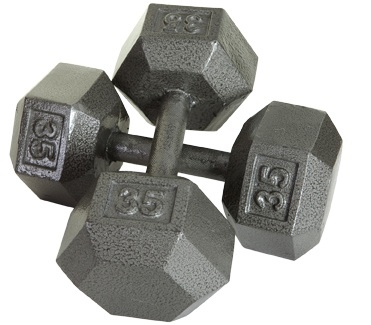 Order your Troy USA Solid Hex Dumbbells 5-100lbs Set IHD-005-100 from FitnessZone.com today!